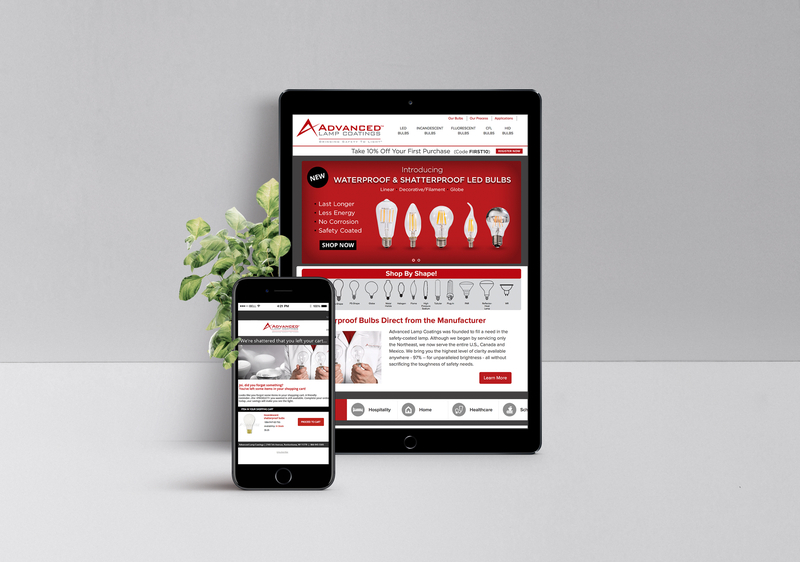 Advanced Lamp Coatings, a leading manufacturer of shatterproof bulbs, was looking to expand its sales reach and reinvigorate it’s brand online. Linx was retained to conduct market research to uncover what ALC’s competition was doing in order to identify a clear strategy to differentiate ALC to the marketplace. We uncovered an opportunity to align ALC’s services with the way consumers discover and shop for products, and leveraged this insight to create a discoverable platform that caters to the shoppers’ buying process. Linx developed a new design and product structure for the e-commerce website platform. We started by creating a new contemporary design to compliment the brand, that incorporated large stylized imagery and value-focused messaging. We also developed a "shop by shape" icon system right on the homepage to improve the online shopping experience for streamlined product browsing. As with any e-commerce website, Linx new is was important to offer special pricing promotions in order to drive more sales, so we developed callouts for discounts on the homepage and throughout the site, as well as a new tiered pricing strucutre that offered discounts for products purchased in bulk. Linx developed a custom e-commerce platform to encourage increased quantity purchases through a tiered pricing strategy. The site was built with optimal UX/UI in mind for easy browsing of products and usage across desktop, tablet and mobile devices. Advanced Lamp Coatings has seen a 33% increase in overall sales volume, with new wholesale and distributor clients as a result of the professional trust ALC’s new online image conveyed. PPC has driven ROI as high as 5x on Google Shopping, and there is consistent ongoing organic growth as a result of SEO efforts. In addition, ALC has seen a 35% increase in phone order on top of internal online sales. Linx is always looking for products to own and sell. E-Ternal Candle is at the top of that list.